Acne problems are the unsightly remnants of acne spots, which can mar the facial skin and make the whole face unattractive. Some acne scars are not too noticeable because of their shallow nature; these are the scars that eventually go away with the passage of time. Deep acne scars, however, have a tendency to leave unsightly pits on the face, and need to be addressed by a cosmetic procedure to bring back the clarity of the whole face. Acne scars tend to leave dark marks on the face that can affect the overall sense of well being of the patient – especially if the scars are left by large pimples that got infected. The marks left by acne scars can cause an individual to lose confidence in the way he or she looks – and can even adversely affect the way this individual interacts with those around him or her. Laser treatments in Kent are the most popular and most effective ways for the removal of unattractive acne scars. A dermatologist will first assess the condition of the acne scars, as well as the overall health of the patient, to determine the suitability of a laser treatment. It should be noted that the laser treatment is not recommended for those who still have active acne. Box Car Scars – These acne scars are similar to chickenpox scars, and are usually found on the cheeks and temples; they are angular scars that have sharp vertical edges. Ice Pick Scars – These acne scars are the most common/classic sign of acne scarring, and are characterized by deep pits that look like they have been punctured with the use of an ice pick (hence the name). Rolling Scars – These are acne scars that tend to be shallow, and can give the skin a wave-like appearance. Hypertrophic Scars – These are acne scars that have a lumpy and raised appearance. Proper treatment of acne as it develops – It is important to treat acne in its earliest stages, to prevent more serious complications from developing. Treating acne as soon as it develops will go a long way in ensuring that no further worsening can occur – and that more problematic acne scars are prevented from forming on the skin. Do not pop or squeeze pimples – There are times when it may be too tempting not too pop or squeeze pimples that look “ripe” enough to be popped; this is one of the worst things you can do for your skin! Squeezing or popping the pimple can cause the bacteria inside to spread to the surrounding skin, so what used to be one pimple can form a few more in the surrounding area within a few hours. Popping a pimple can also cause the skin to be severely inflamed, and the resulting damage to the skin can cause deep acne scars. Pimples and blemishes should be left alone (not touched/popped/squeezed) until they heal with the help of medications or other treatments that are specifically for this condition. Avoid irritants that may cause skin inflammation – Acne-prone skin is more susceptible to irritants, especially during an active acne flare-up. It is important to stay away from irritants that can cause the pimples to become inflamed and infected, as the infection can increase the chances of the acne leaving unsightly scars even after the healing of the pimples is finished. Determine if you are prone to scarring – Individuals who are prone to scarring should seek the advice of their doctor or dermatologist in Kent right away, to deal with the acne scars problems in the soonest possible time. The tendency to develop scars on the skin varies from person to person; if you know that you are prone to scarring, early treatment can reduce the chances of more serious acne scarring problems in the future. Go to your doctor ASAP for large-scale acne breakouts – A large scale acne breakout – for example, one that covers most of the face – should be checked by a doctor or dermatologist in Kent as soon as possible. The large, deep-seated pimples have higher risks of developing into deep acne scars, so early treatment is necessary. Avoid too much exposure to the sun – The sun’s rays can delay the natural healing process of the skin, and can cause more damage to acne and early acne scars. Always use a sunscreen (one that is approved by your dermatologist) to protect your skin from the sun’s harmful rays. Do not pick on acne scabs – Scabs are formed when the healing process underneath the pimples has started, so they should be left alone. Picking on acne scabs before they are ready can interrupt the healing process, and can prolong the overall healing of the acne. 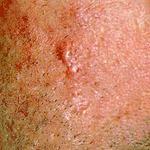 An acne scab that has been picked or interfered may also cause infection to once again flare up.